The misadventures of Count Nicholas D'Orloff were more serious. A few weeks after his enlistment, in Brisbane in August 1915, he was discharged from the army because of his absence without leave (he himself argued that he had applied for leave, to marry a girl who was waiting for him). But this was only the beginning. A matter of days after his discharge he was detained at Maryborough for wearing military uniform and tried by a police magistrate. 'The offender claims to be a Russian ... but judging by the acquaintances he desires to make and associate with, his feelings would appear to be pro-German'; further damning evidence was given that, besides Russian and English, he also spoke German and French (if he really was a Russian count, that would have been quite natural!). 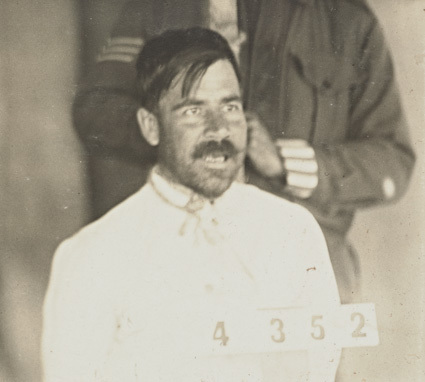 As a result, he received three months' imprisonment with hard labour at Brisbane gaol. While he was in prison, the Intelligence section decided that he was actually a well-known criminal named Felix Richardson, so he was transferred to a concentration camp for Germans at Liverpool and finally, in 1919, deported from the country.